Estonia, officially the Republic of Estonia is a country in Northern Europe. It is bordered to the north by the Gulf of Finland, to the west by the Baltic Sea, to the south by Latvia (343 km), and to the east by the Russian Federation (338.6 km). 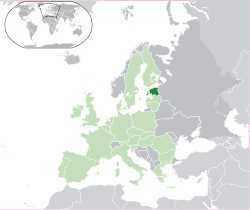 The territory of Estonia covers 45,227 km2 (17,462 sq mi) and is influenced by a temperate seasonal climate. The Estonians are a Finnic people, with the Estonian language exhibiting many similarities to Finnish. The modern name of Estonia is thought to originate from the Roman historian Tacitus, who in his book Germania (ca. 98 CE) described a people called the Aestii. Similarly, ancient Scandinavian sagas refer to a land called Eistland, close to the Danish, German, Dutch, Swedish and Norwegian term Estland for the country. Early Latin and other ancient versions of the name are Estia and Hestia. Esthonia was a common alternate English spelling prior to independence. Estonia is a democratic parliamentary republic and is divided into fifteen counties. The capital and largest city is Tallinn. With a population of only 1.34 million, Estonia is one of the least-populous members of the European Union. Estonia was a member of the League of Nations from 22 September 1921, has been a member of the United Nations since 17 September 1991, of the European Union since 1 May 2004 and of NATO since 29 March 2004. Estonia has also signed the Kyoto protocol. The settlement of modern day Estonia began around 8500 BC, immediately after the Ice Age. Over the centuries, the Estonians were subjected to Danish, Teutonic, Swedish and Russian rule. Foreign rule in Estonia began in 1227. In the aftermath of the Livonian Crusade the area was conquered by Danes and Germans. From 1228–1562, parts or most of Estonia were incorporated into a crusader state Terra Mariana, that became part of the Ordensstaat, and after its decline was formed the Livonian Confederation. In the 1500s Estonia passed to Swedish rule, under which it remained until 1721, when it was ceded to the Russian Empire. The Estophile Enlightenment Period (1750–1840) led to a national awakening in the mid-19th century. In 1918 the Estonian Declaration of Independence was issued, to be followed by the Estonian War of Independence (1918–1920), which resulted in the Tartu Peace Treaty recognising Estonian independence in perpetuity. During World War II, Estonia was occupied and annexed first by the Soviet Union and subsequently by the Third Reich, only to be re-occupied by the Soviet Union in 1944. Estonia regained its independence on 20 August 1991. It has since embarked on a rapid programme of social and economic reform. Today, the country has gained recognition for its economic freedom, its adaptation of new technologies and was one of the world's fastest growing economies for several years. However, Estonia's economy was second worst hit of all 27 European Union members in the 2008–2009 economic crisis, contracting sharply in the first quarter of 2009. Human settlement in Estonia became possible 11,000 to 13,000 years ago, when the ice from the last glacial era melted away. The oldest known settlement in Estonia is the Pulli settlement, which was located on the banks of the river Pärnu, near the town of Sindi, in southern Estonia. According to radiocarbon dating, it was settled around 11,000 years ago, at the beginning of the 9th millennium BC. Evidence has been found of hunting and fishing communities existing around 6500 BC near the town of Kunda in northern Estonia. Bone and stone artifacts similar to those found at Kunda have been discovered elsewhere in Estonia, as well as in Latvia, northern Lithuania and in southern Finland. The Kunda culture belongs to the middle stone age, or Mesolithic period. The end of the Bronze Age and the early Iron Age were marked by great cultural changes. The most significant was the transition to farming, which has remained at the core of Estonian economy and culture. From approximately the first to 5th centuries AD, resident farming was widely established, the population grew, and settlement expanded. Cultural influences from the Roman Empire reached Estonia, and this era is therefore also known as the Roman Iron Age. The first mention of the people inhabiting present-day Estonia is by the Roman historian Tacitus, who in his book Germania (ca. AD 98) describes the Aestii tribe. Tacitus mentions their term for amber in an apparently latinised form, glesum (cf. Latvian glisas). This is the only word of their language recorded from antiquity. In spite of this point, the Aestii are generally considered the ancestors of the later Baltic peoples. A more troubled and war-ridden middle Iron Age followed with external dangers coming both from the Baltic tribes, who attacked across the southern land border, and from overseas. Several Scandinavian sagas refer to campaigns against Estonia. 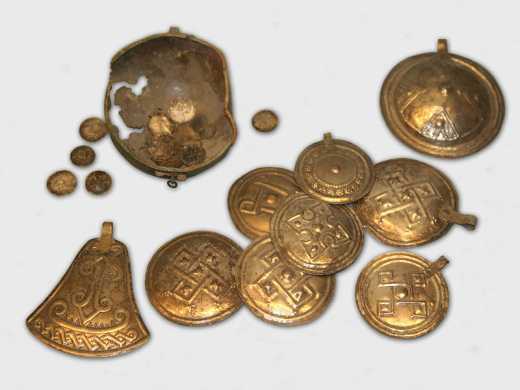 Estonian pirates conducted similar raids in the Viking age. 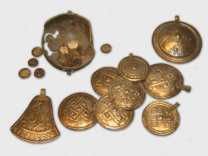 The "pagan raiders" who sacked the Swedish town of Sigtuna during the early middle ages, in 1187 may have been Estonians. In the first centuries AD political and administrative subdivisions began to emerge in Estonia. Two larger subdivisions appeared: the province (Estonian: kihelkond) and the land (Estonian: maakond). The province comprised several elderships or villages. Nearly all provinces had at least one fortress. The defense of the local area was directed by the highest official, the king or elder. The terra was composed of one or several provinces, also headed by an elder, king or their collegium. By the 13th century the following major lands had developed in Estonia: Revala, Harjumaa, Saaremaa, Hiiumaa, Läänemaa, Alempois, Sakala, Ugandi, Jogentagana, Soopoolitse, Vaiga, Mõhu, Nurmekund, Järvamaa and Virumaa. Estonia retained a pagan religion centred around a deity called Tharapita. The Chronicle of Henry of Livonia mentions Tharapita as the superior god of Oeselians (inhabitants of Saaremaa island), also well known to Vironian tribes in northern Estonia. At the beginning of the 13th century, Lembitu of Lehola, a chieftain of Sakala sought to unify the Estonian people and thwart Danish and Germanic conquest during the Livonian Crusade. He managed to assemble an army of 6,000 Estonian men from different counties, but he was killed during the Battle of St. Matthew's Day in September, 1217. In the aftermath of Livonian Crusade from 1228 to the 1560s Estonia became part of Terra Mariana, established on February 2, 1207 as a principality of the Holy Roman Empire and proclaimed by pope Innocent III in 1215 as a subject to the Holy See. The southern parts of the country were conquered by Swordbrothers who joined the Teutonic Order in 1237 and became its branch known as Livonian Order. In the Northern parts of the country was formed Duchy of Estonia as a direct dominion of the King of Denmark from 1219 until 1346 when it was sold to the Teutonic order and became part of the Ordenstaat. In 1343, the people of northern Estonia and Saaremaa rebelled against the German rule in the St. George's Night Uprising, which was put down by 1345. After the Teutonic Order fell into decline following its defeat in the Battle of Grunwald in 1410, and the defeat of the Livonian Order in the Battle of Swienta on September 1, 1435, the Livonian Confederation agreement was signed on December 4, 1435. The Grand Duchy of Moscow and Tsardom of Russia attempted unsuccessful invasions in 1481 and 1558. The wars had reduced the Estonian population from about 250–300,000 people before the Livonian War to 120–140,000 in the 1620s. 1 - Võro and Seto in southern counties are spoken along with Estonian. Russian is widely spoken in Ida-Virumaa due to the Soviet program promoting mass immigration of urban industrial workers from the USSR in the post-war period. 2 - 47,549 km² (18,359 sq mi) were defined according to the Treaty of Tartu in 1920 between Estonia and Russia. Today the remaining 2,323 km² (897 sq mi) are nowadays part of Russia. The ceded areas include the Petserimaa county and the boundary in the north of Lake Peipus as the Lands behind the city of Narva including Ivangorod (Jaanilinn). 3 - .eu is also shared with other member states of the European Union. This page was retrieved and condensed from (http://en.wikipedia.org/wiki/Estonia) November 2009.